NEW! DNA testing of ancient human remains suggests European association. Irish petroglyph detail. Compare to the West Virginia petroglyph detail at the top left of this page. For the first time it is possible to say with some degree of certainty that there is real evidence of pre-Columbian visitors to the North American continent. In fact, you could say it is carved in stone. Twenty years of research leads to the conclusion that the same disciplines and tools were employed to create Ogam glyphs and Christian symbols (Chi-Rho) on rock faces in both southern West Virginia and southern Ireland. 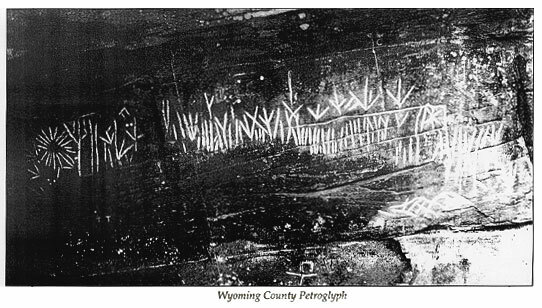 In 1981, archaeologist Robert L. Pyle of Morgantown, West Virginia began exploring the mountains of southern part of the state studying petroglyphs (markings on stone) that at first glance resembled archaic runes and were different from traditional ancient American rock carvings. His archaeological research focused on petroglyph sites in Wyoming County, West Virginia, and Manchester, Kentucky. Research indicated the markings were an ancient alphabet known as Ogam (or Ogham), found in the British Isles, especially Ireland, Scotland, and Wales. 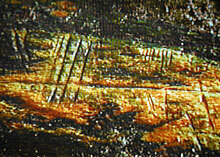 (The petroglyphs in West Virginia and Kentucky exhibit what is known in Europe as "stem type Ogam.") The markings were considered in connection with the tradition of St. Brendan's voyages to this continent in the 6th century. Another view of the recently discovered Irish petroglyph. Note the vertical Ogam markings. 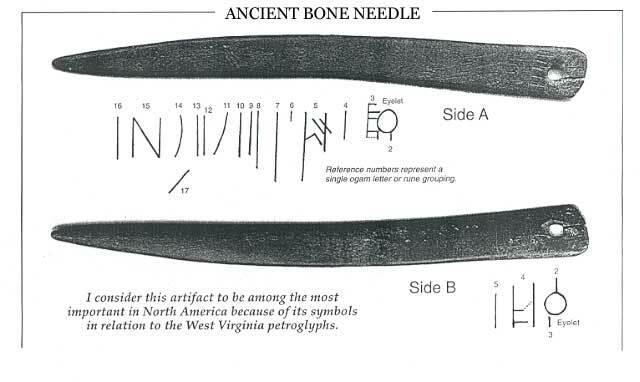 Dr. William Grant, Edinburgh University, Scotland, and Dr. John Grant, Oakland, Maryland, both Celtic linguists/scholars, participated in Pyle's Ogam research in southern West Virginia and endorsed the West Virginia petroglyphs as authentic archaic Ogam. The Grants were former students at the Catholic University in Washington, DC, under the direction of Dr. Robert Meyer, Celtic professor and linguist for 33 years. 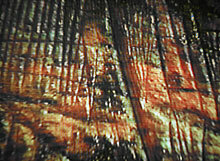 In 1998 and 2000, Pyle traveled to Ireland to investigate Ogam markings. In 2000 Dr. William Grant invited Pyle to participate in a research team that examined the first known Irish Ogam petroglyph panel, located in the remote and rugged mountains of southern Ireland. Ogam has commonly been found on corner edges of tombstones, not on rock formations. The unique Irish petroglyph panel turned out to be larger and more complex, yet the markings were virtually identical to the West Virginia and Kentucky petroglyphs. Stephen O'Shea, Earl E. Hill, Dr. William Grant, Robert L. Pyle, Breda O'Shea, and Mike Baker. Photo taken in southern Ireland. The expedition was mounted by Dr. William Grant and led by Stephen O'Shea. Michael Baker, a film producer, and crew documented the entire expedition. Five hours of strenuous climbing led to the petroglyph location in a "wedge tomb" where Pyle immediately recognized the similarities between Irish and American petroglyphs. The panel is 8 feet high and 20 feet long, and the markings are textbook examples of the alphabet known as Ogam. Significant features include: (1) the Irish Ogam is identical in form to that found in West Virginia and Manchester, Kentucky; (2) it is identical in form to that found in the Book of Balleymote, which is located in the Royal Irish Academy in Dublin; (3) the same types of symbol are identified on artifacts and cliff carvings. Our work has just begun and funding is needed for preservation, historical research, museum exhibits, and preparation of educational documentaries. Copyright 2005 by Prehistoric West Virginia. All rights reserved.